Why does my dog have fits? Fits or seizures are really distressing for us, and they can be dangerous for our dogs. However, there are a wide range of different causes, many of which are treatable. Even Idiopathic Epilepsy is fully controllable in the vast majority of cases, so a proper workup and diagnosis is invaluable! A fit or seizure (the words mean more or less the same) is defined as being the physical manifestation of a massive surge of abnormal electrical activity in the brain. In many ways, they can be described as “brainstorms”, as the normally organised and carefully ordered electrical circuits in the brain overload. ● Pre-Ictal Phase: before the seizure occurs, many dogs will display abnormal behaviour, typically restless, fearful or nervous. This is similar to the “aura” that many human epileptics experience. ● Ictal Phase: this is the actual seizure, which is often associated with uncontrolled muscular contractions. There are, however, several different types of seizure, see below for details. ● Post-Ictal Phase: once the seizure has finished, it takes a while for the brain to “reboot” and start working again properly - maybe a few minutes, maybe as long as 24 hours. In this period, the dog will behave unusually, seem restless or extremely tired, and may exhibit some neurological symptoms e.g. blindness. Is it the same as a convulsion? Technically, the terms mean different things. A seizure is due to abnormal brain activity, whereas convulsions mean disorganised muscle contractions due to any cause - so convulsions can occur with or without a seizure (for example, in some poisoning cases or electrocution). There are four main groups of seizures we see in dogs. ● Generalised Seizures: these completely overload the brain, resulting in loss of consciousness and full collapse. They usually result in paddling of the limbs and/or rhythmic jerking of the body (sometimes known as “tonic-clonic seizure activity”); loss of control of bladder and bowels; and champing of the jaws, usually with frothing at the mouth. Although very unpleasant, as far as we know the dog isn’t aware of what’s going on. ● Partial or Focal Seizures: in these, only a small part of the brain becomes erratic, resulting in the dog remaining conscious but perhaps losing control of one part of their body, a limb for example. They are rarer than generalised seizures. ● Psychomotor Seizures: these are the rarest of all, and are a type of focal seizure where the part of the brain that is affected isn’t involved in controlling muscles, but in perception and sensory input. Dogs with a psychomotor seizure appear to suffer from hallucinations, seeing and reacting to objects that aren’t actually there. ● Status Epilepticus: if a seizure lasts for more than 5 minutes, or a second one occurs without the dog regaining full consciousness, this is an emergency and needs urgent veterinary treatment. There is a high chance that without it, the dog will not survive. The causes of seizures can be divided into two groups - secondary seizures (where the abnormal brain activity is caused by something external, altering the brain’s function) and primary seizures (where a brain malfunction is responsible). ● Metabolic disease - such as kidney failure, liver disease, or abnormal salt or nutrient balances in the blood. In particular, the correct levels of glucose, oxygen, sodium and calcium are vital to maintain brain function. 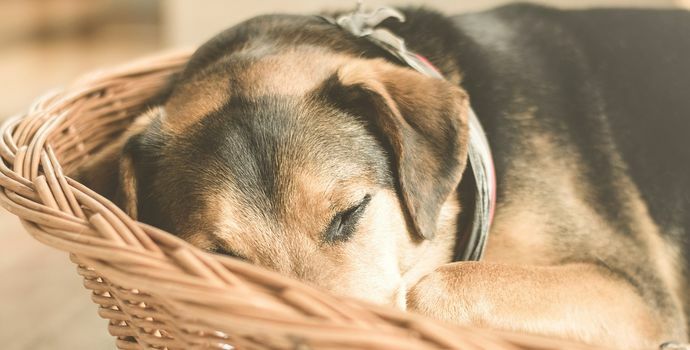 Low blood sugar levels (perhaps due to an overdose of insulin in a diabetic dog), and abnormally high blood glucose levels (in an untreated diabetic) can both lead to seizures. ● Poisoning - some toxins (such as lead, usually from paint, and metaldehyde, found in slug pellets) can cause severe and possibly fatal seizures. ● Head trauma - brain damage or concussion from a blow to the head often leads to seizures. ● Inflammatory diseases such as meningitis or encephalitis can trigger a fit. In turn, this may be due to infectious (e.g. Neospora infection, Distemper Virus, or bacterial meningitis) or auto-immune diseases (e.g. Granulomatous Meningoencephalitis). ● Brain tumours can, by pressing on the tissues around them, cause a syndrome of steadily worsening seizures, although they are fortunately fairly uncommon in dogs. ● Idiopathic or Primary Epilepsy is by far the most common cause! This is a complex condition characterised by recurrent seizures in the absence of a secondary cause or any physical brain damage. It is usually first diagnosed between 6 months and 5 years of age, and is thought to be largely (but not entirely) genetic in origin. ● X-rays, CT or MRI scans for trauma or tumours. ● Spinal Taps (where a small sample of the Cerebrospinal Fluid that surrounds the brain and spinal cord is extracted to test) for meningitis and encephalitis. In an emergency, the preferred treatment is a drug called diazepam; this may be given into a vein by us at the practice, or by a rectal tube at home. For longer term management, it is VITAL to work out what the cause is - many of the secondary causative diseases can be effectively treated, and when they have been treated, the seizures will stop on their own. If the underlying cause cannot be treated (e.g. Idiopathic Epilepsy), then the seizures themselves can be managed with a combination of drugs. Phenobarbitone is the most commonly used drug, and is both cheap and effective. However, the safe dose range is relatively narrow, and so dogs on phenobarb require regular blood tests to check the drug levels and their liver function. If phenobarb alone is insufficient, potassium bromide can be used as well to “top it up”. A newer drug, imepitoin, is now available for seizure control instead of the older phenobarb. 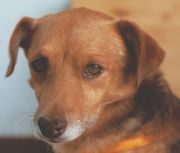 Although more expensive, it is safer and does not require regular blood tests - however, a certain percentage of dogs simply will not respond to it. A small minority of dogs will not respond to the normal treatments; in these cases, a range of other (human) drugs are available that our vets will try, until we find the combination that suits that dog best. If your dog has had a seizure, make an appointment to get them checked out as soon as possible. If they are still having one, call us RIGHT AWAY!